The Grindmaster-Cecilware MT3UL three-bowl frozen drink machine is optimized to make preparing and serving a variety of drinks as simple as possible. Each bowl can hold up to 21⁄2 gallons of liquid with individually-controlled temperature settings, allowing you to serve any combination of cold and frozen drinks. 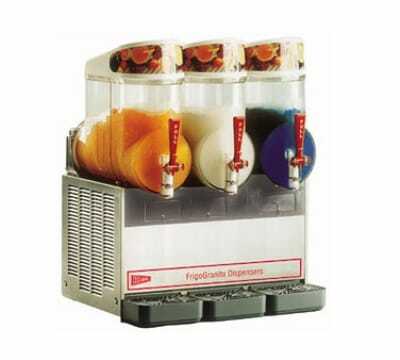 Frozen drinks are brought up to temperature quickly with a two-sided freezing chamber that works with the constantly-churning auger to produce quickly-frozen drinks without large chunks of ice. Along with the see-through bowls, the unit also merchandises your products with lit graphic panels on top of each bowl. The MT3UL also makes cleaning and maintenance simple. This model features easily removable bowls, augers, faucet assemblies, and drip trays for simple cleaning and sanitizing, and a filter indicator light lets you know when the removable condenser filter needs cleaning as well. The motor is low-maintenance, with a magnetic drive system that prevents burnout. This motor and auger also operate quietly, at below 70 decibels, to keep the ambient noise low so the unit can be comfortably placed in customer areas. The exterior of this unit is stainless steel, which is resilient and easy to wipe clean.